Michael comes home to Ellery to face his past, only his present keeps intruding in the form of his agent Alex Casey, who won’t take no for an answer. Michael Hardin is back in Ellery to face his past. The victim of a hate crime, he has memories that lie just out of his reach and nightmares that won’t leave him alone. Alex Casey loves Michael but he completely ruined everything by treating Michael like someone who needed to be wrapped in cotton wool. Can Michael discover more about his past and find love with Alex? NB: This book was previously published. The second edition features new cover art and the book has been re-edited with approximately 3000 additional words added to the story. I think this is my favorite book of the series. I've been waiting for Michael's (Mikey) story and it was so worth the wait. I think this is my favorite book of the series. Mikey is nearly beaten to death in a hate crime back in book 5 (The Paramedic and the Writer) but just who tried to kill him was never found out. While you might be able to enjoy the books in this series if you read them out of order, you will definitely enjoy this one more if you read The Paramedic and the Writer first. That one gives you Mikey's backstory and will enhance your enjoyment of The Agent and the Model. Michael has become a very successful model but a stalker attacks him and it brings back memories of the attack on him when he was a teen. 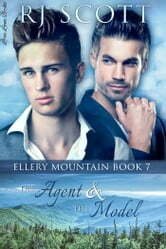 Michael's agent, Alex Casey, is also the man Michael loved until he found out that Alex as keeping secrets from him. Alex is so sorry that he let Michael down. He loves him and can't stop begging Michael to forgive him for leaving him unprotected. Michael just can't seem to get past what Alex did; he doesn't even want to model any more and tells Alex he's through and won't be renewing his contract. Both Michael and Alex end up back in Ellery; Michael to stay with his grandmother and Alex to stay with his friend Jason (from book 3). It was good to visit with old friends from the earlier stories but it was the interaction between Michael and Alex that kept me glued to my ereader until I finished this book. Although I loved all of the books in this series, I had a much more emotional reaction to Michael's story. I'm not sure if it's because of what happened to him when he was young or if it was just the strong emotions going on between Michael and Alex. Whatever the reason, this story hurt my heart and then healed it again. Thank you, RJ Scott, for another wonderful story. An advanced copy of this book was provided to me but my review was voluntary and not influenced by the author.